Today is a lazy day.. no cooking for this lady, in Paris, France, yet I have a fantastic recipe that just appeared today (oh miracle!) on my Facebook page.. so Welcome!! 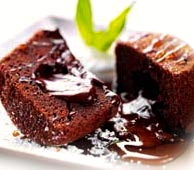 Here is a sweet yet soft and light chocolate pudding, not to be missed !!! Why ask for more during these Holidays days ???? Prepare eight ramekin dishes by thoroughly buttering the inside and dusting with flour. Place a disk of greaseproof paper in the bottom of each ramekin. Melt the chocolate, honey from one FAGE Total Honey Yogurt, and butter together over a pan of water. Whisk sugar, egg yolks and eggs until the mixture forms soft peaks. Fold the chocolate mix into the egg mix, then fold in the flour. Pour into ramekins and bake in the center of the oven for seven minutes, or until the puddings have risen above the ramekins. Allow to rest in a warm place for 2 minutes. To serve, turn out onto the center of a plate with a generous spoonful of FAGE Total Yogurt (half of the yogurt in a FAGE Total with Honey split cup). Drizzle with the remaining honey. Can be prepared 48 hours in advance.